Katrina was designated a rare Category 5 Hurricane, the strongest designation for a storm on Earth, and one that indicates sustained winds greater than 250 kilometers per hour. NASA spacecraft watched closely in 2005 as a record-breaking Atlantic hurricane season yielded 27 named storms, including the devastating Hurricane Katrina, seen here at full strength in an Aug. 29, 2005 image from the GOES-12 weather satellite. Hurricane Katrina winds above Earth. 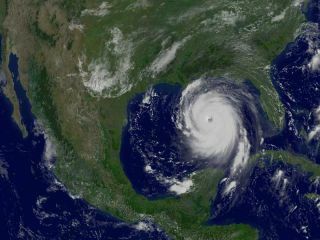 Hurricane Katrina moved ashore over southeast Louisiana and southern Mississippi early on August 29, 2005, as an extremely dangerous Category 4 storm. This image and animation from NASA’s Multi-angle Imaging SpectroRadiometer (MISR) show the strong convective development of Hurricane Katrina on Saturday, August 27, as it moved west through the Gulf of Mexico. “Katrina is comparable in intensity to Hurricane Camille of 1969, only larger,”warned the National Hurricane Center on Sunday, August 28, 2005. The Louisiana Superdome is now an island refuge for as many as 30,000 people, according to news reports. Many sheltered in the stadium while Hurricane Katrina raged overhead on Monday, August 29, 2005, and many more have been brought to the Superdome after being rescued from their flooded homes. NASA-built satellites provided much information about Katrina's devastation, including the potential impact on climate change. The storm’s sustained winds of 125 miles per hour killed or damaged an estimated 320 million large trees.